The scene of this picture is a prime example of why it is such a delight to be a Mystic Seaport Wedding Photographer. The photograph shows the heart of Mystic Seaport, the Thomas Oyster House. The building is highly requested as a backdrop for a Mystic Seaport Wedding Photographer to take bridal portraits in front of. The building was constructed around 1874 by a man named Thomas Thomas during a time when New Haven, Connecticut was the largest oyster distribution center in New England. Today, the only working oyster shop left in the state is located in South Norwalk, making building like this one historical treasures. In 1967 it was found that the Thomas Oyster House is one of the few remaining structures of its kind -- a small, typical northern oyster house. This couple basks in the history of the setting the building provides and in the love that has brought them to this magical day. I took the picture of them as the afternoon drew closer to evening, and dusk began to set in. It had been a bit of a cloudy day, but in this picture blue skies can be seen peeking through the gray blanket above. Sailboats lean against the dock beside the oyster house, gently swaying in the breeze. 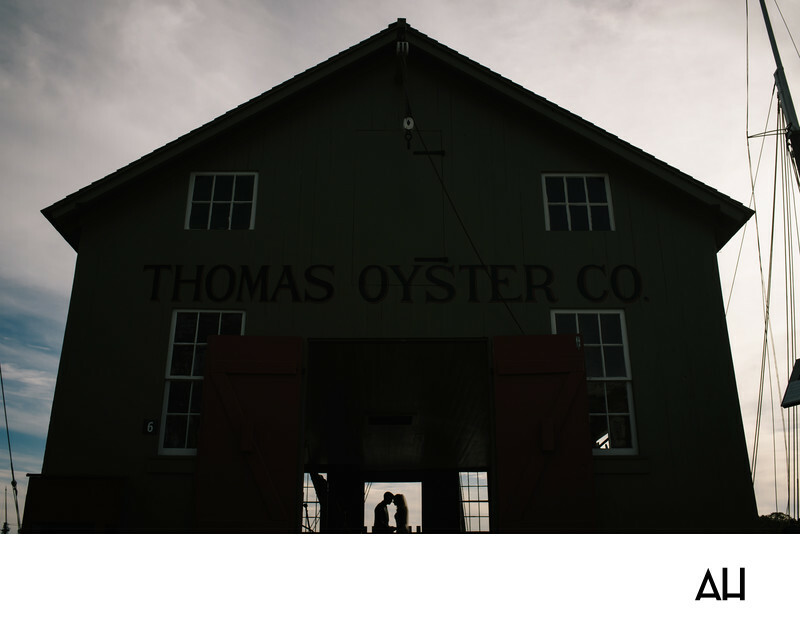 The bride and groom are seen within the doors of the oyster house as silhouettes, as the daylight slowly fades into the water behind them. They stand holding hands, with foreheads touching. It is precious and reflective moment between the husband and wife, who are ready to move forward into the joy of their marriage.